Manaslu Trek via Tsum Valley, around mighty 8163 meter high Mount Manaslu and hidden valley of Tsum is unexpectedly popular among wilderness trekking keens. 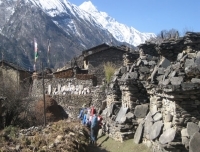 Manaslu region was opened for the trekkers only in 1995 and Tsum was also just released in 2008. Manaslu and Tsum Valley Trek in this geographically extra spectacular and culturally most mesmerizing area, that rewards the trekkers to discover ultimate nature and cultural heritage and experience the mountain life style in Tsum Valley and Manaslu. 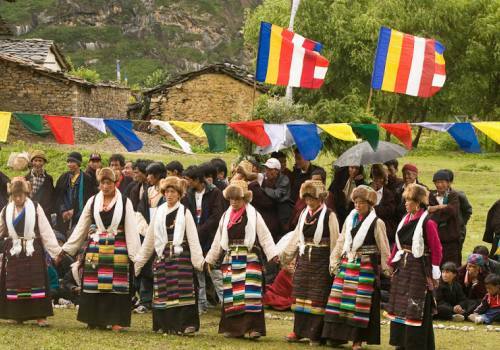 The residents of upper Bhudi Gandaki, a region known as ‘Nup Ri’ meaning Western Mountain are direct descendants of Tibetan immigrants and they settled here during early 16th century consequently their speech, dress and customs are absolutely similar to Tibetans in the North of Nepal. The Mountain Views in Nup Ri are sensational and iconic that you can find nowhere in the world. The dramatic Larke Pass after visiting Tsum Valley is thrilling life that experience. Tsum Valley, also called "beyul" literally meaning "Hidden valley in which people can take refuge at times of political disturbance and where Buddhism can be practiced safely" is yet being explored and right place to trek for the travelling passionate. The valley is a blessed with Himalayan Buddhist pilgrimage site located in northern part of Gorkha district, Nepal. In another sense ‘Tsum’ meaning vivid against the majestic backdrop of the Ganesh Himal, Sringi Himal and Boudha Himal Ranges, this serene Himalayan valley is rich in ancient art, culture and religion. It is said that the Buddhist saint Milarepa is believed to be meditated in the caves of these mountains. The valley is home of some of the unique and historic monasteries, including Mu Gompa and Rachen Gompa, mani and prayer walls which lie on a pretty highland nestled in the lap of the valley and Gompa Lungdang, situated at the base of a conical hill against the main slope of Ganesh Himal. The tribes here celebrate many Buddhist festivals, perform ritual burning of juniper sense to purify the air and Mother Nature, place the prayer flags and install Mani Walls for happiness of the entire sentient living beings. The area is left behind from modernity so their culture remained as it is as it was centuries ago. The palace is really tempting for the trekkers. 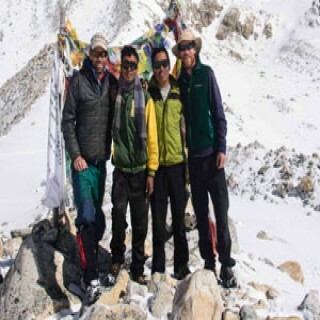 Here we have customized two itineraries for the Manaslu and Tsum Valley Trek and we Wilderness Excursion operate perfect and ideal mountain holiday in budget cost. Our first day of the journey starts by a day drive to Soti Khola – our trekking starting point which leads Manaslu circuit and Tsum valley trek. To reach Kathmandu to Soti Khola, you will have to go past Arughat bazaar 570 elevations. Kathmandu to Arughat normally takes around 6-7 hours. From Arughat it takes another 1:30 -2 hours to reach Soti Khola; again depends on the road condition, the type of transportation, driving speed etc. Our guide will pick you from your hotel at selected time. Drive to Soti Khola which lies at an elevation 700 meters above sea level. Local bus service available from Kathmandu to Soti Khola distance but it is not recommended. We do provide transportation service by jeep or bus for Kathmandu to Soti Khola distance via Arughat Nepal. Kathmandu to Soti khola distance is 141.3 kilometers / 87.7 mile it takes 8-9 hours by drive. And stay overnight there. Day 02: Trek to Machha Khola (869m). 5-6 hours walk. After taking a nice breakfast; we set off from Soti Khola to Machha Khola which in lies at the elevation of 869 meters from sea level and it takes about 6 hours total time. Alternatively you can still plan on going a bit further to Khorlabeshi (970m). The village of Machha Khola is bigger than Khorlabesi and you could do washing and flashing yourself at fresh Machha Khola water. Overnight in Machha Khola. Day 03:Trek to Jagat (1340m), 6-7 hours walk. The third-day your Manaslu and Tsum valley trek today has some ups and downs which will make our trail challenging to some extent. From Machha Khola, we will cross the Tharo Khola and reach Khorlabesi. Khorlabesi is another small yet beautiful Gurung village. After another short steep climb, we will reach Tatopani, a hot-spring site where we will be spending some time to enjoy the natural sauna. Then we will climb over a ridge, crossing the Budhi Gandaki River through the suspension bridge and climb up the staircase and a ridge to finally reach Doban. After crossing another suspension bridge, we climb another stone staircase, go down to the river and climb the stairs again to reach Thado Bharyang. We will walk here in Nepal’s first cantilever bridge. Then we will cross the west bank of Budhi Gandaki River, climb over the ridge and walk along the river to reach Jagat village. We will here in Nepal’s first cantilever bridge. It is the entry checkpoint of the Manaslu Conservation Area. We will stay here for a night. Day 04:Trek to Lokpa (2240m), 5-6 hours walk. Today we will enter into restricted region of Tsum Valley. Guide will register your permit in checkpoint at Jagat. On the very first part you will trek a little bit through riverbank. After some up and down through Shridibas settlement of Philim come into your sight. Pass through suspension bridge and stop in Philim for lunch. Explore village of Philim and Japanese made school there. As you pass by Ekle Bhatti trail get separated toward Tsum and Manaslu. Pass through the welcome board and hike up toward Lokpa. You might feel like it is early to stop in Lokpa (2240m) but next settlement Chumling is far to go further. Overnight in lodge at Lokpa. Day 05: Trek to Chhumling (2386m), 5 hours walk. Today our plan is to make Chumling from Lokpa and it is only 4-5 hours of hike but it is demanding and there no any lodges in between so don’t forget to carry energy bar or snickers. Trail completely passes through silence of tropical forest. You will encounter numerous up and down until you arrive small suspension bridge. Trail gets diverted from this bridge toward Ripchet and Chumling. You will cross the bridge and walk pass by small stone wall made by the side of trail. Chumling is not that far from this point. There are few teahouses by main trail. Late afternoon you can make small side trip to upper part of Chumling, there are few teahouses too. There is monastery at the upper end of village you can go for view of Ganesh Himal. Personal hygiene is not that good so use hand sanitizer every thirty minutes or whenever possible. Depending on season fields might be covered by barely or buckwheat. Big Chorten on middle of field helps to enrich the view of small valley. Stay there for overnight. Day 06:Trek to Chhekampar (3011m), 5-6 hours walk. From Chumling; the day begins with a cross over a suspension bridge onto the opposite bank. We rejoice the great views of Ganesh Himal. Walk past Rainjam to Serpu Khola crossing another bridge we arrive at the Gho Villag having local teashop. Another continues 2 hours climb to Tsum takes us to the stunning traditional village of Chhokangpar. Weather permitting; enjoy the views of Himalchuli at 7893 meters and Ganesh Himal at7140m. 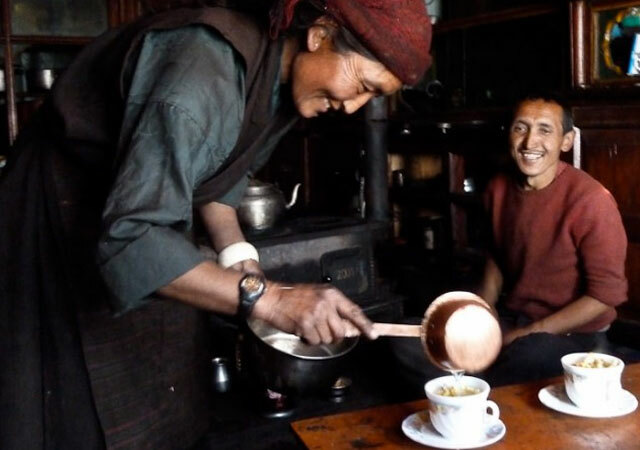 Stay overnight at Chokhangpar in Tashi Delek lodge. Day 07:Trek to Nile (3310m), 6 hours walk. Today it is easy walk of 5-6 hours to Nile from Chhekampar. We may visit Milarepa Cave (locals called it Piren Phu). The entrance fee was NPR 300 as of 2015. Though it is an easy walk to Nile; we may feel altitude as we go higher so it is recommended to walk gently above Chokhangparo, better to be careful of altitude problems. We hike through Phurbe and Pangdun. Leaving old historic Stupa of Buddha in a way crossing the village of Chhule, climb upstream and cross the bridge to finally arrive at Nile. If you consider we can make your visit to a famous monastery of Chhule which is located in the top of area. 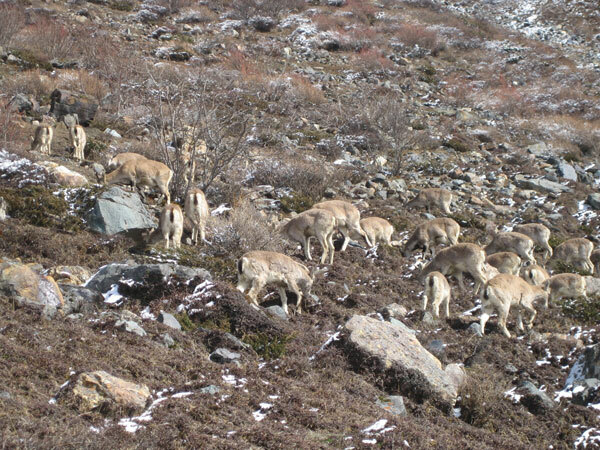 Day 08: Hike to Mu Gompa (3700) and trek to Chhekampar via Rachen Goma, 6-7 hours walk. Day 09:Trek to Lokpa (2240m), 7-8 hours walk. It is same way back to Lokpa via Chumling again though there is an alternative trail via Ripchet that detour at the bridge. Here, we will be following the trail into forest again that takes 6 to 7 hours. Spending a night at Lokpa we will arrange to shift towards Deng. Stay overnight at guesthouse. Day 10: Trek to Ghap (2300m), 6-7 hours walk. The trail goes down to Gumpul where we reconnect with main Manaslu trail. Crossing on the top of stunning gorge and entering the mainly unoccupied area of pine trees previous to drop to a trail junction at New Bridge, we will be following the trail towards the left to Ghap, the Budhi Gandaki and then entering into its narrow gorge on an up-and-down trail with river crossings. After a suspension bridge the trail enters bamboo forest and rises to the village of Deng, hike further towards Rana and Bhi Phedi then to Ghap that takes approximately 7-8 hours depending on your pace and stamina to walk. Overnight in guest house at Ghap. Day 11:Trek to Lho (3180), 5-7 hours walk. Today; it is an easy starts in the beginning, then we will rise up through the bamboo tree and the woodland of Rhododendron along the Budhi Gandaki River. The hydro electric plant will take us to Namrung. We might have lunch break here. Then resume trekking to Lhogaon from Namrung. We are ascending quietly by passing from the outsized stream gracefully downward from the Lidanda Glaciers. At Sho (3,000m), we will take some time for lunch. 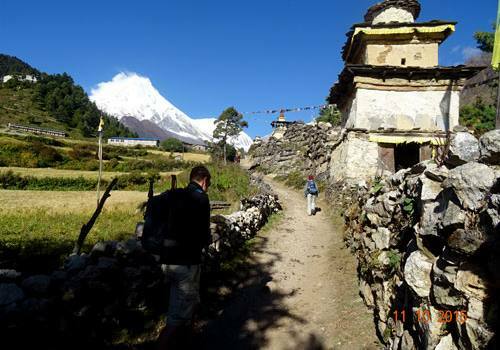 Arriving at Lho at the elevation of 3180 meter, we are taking pleasure from that breath taking scenery of Manaslu. We will put our camp in Lho (3,180m), viewing amazing small Gompa. Stay overnight in a tented camp. Day 12: Trek to Sama Gaun (3520m), 4-5 hours walk. Day 13:Rest day, Hike to Birendra Taal/Pungyen Gompa/ Manaslu Base camp (4400m). 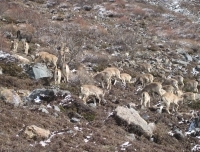 Day 14: Trek to Samdo (3780m), 3 -4 hours walk. 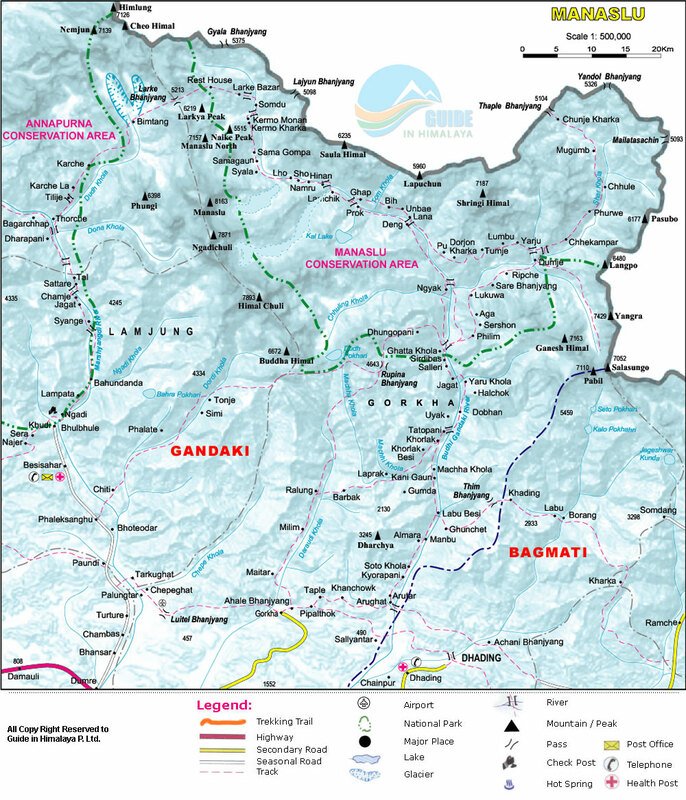 Today, we descend to the Budhi Gandaki River, that has turned north and follow it to a bridge over a side stream. The trail to the left leads to the Manaslu Base camp. The Larkya la Trail passes several mani walls as the valley begins to widen. It is an easy trail on a shelf above the river passing the juniper and birch forests of Kermo Kharka. We drop off the shelf, cross the Budhi Gandaki on a wooden bridge and climb steeply onto a promontory between two forks of the river. From a stone arch we can view a large white kani. Finally passing through the kani we find Samdo ((3780m). Overnight in Samdo. Day 15: Trek to Larke Phedi (4460m) 4 hours walk. Even today, we continue our walk down the edge, cross the wooden bridge over Budi Gandaki and begin walking upward. Upon crossing two streams and witnessing the Larke Glacier we go around the valley of the Salka Khola and climb up again to the stone guest house (4460 m), which is not a lodge but a kind of shelter called Dharmshala, also known as Larke Phedi. This is the highest altitude we sleep. he short walk today also leaves plenty of time for acclimatization and relaxing in the afternoon. Overnight in Dharmashala. Day 16:Trek to Bimtang (3750m), via Larkey Pass (5100m), 8-9 hours. After a short climb, we reach a valley on the north side of the Larke Glaciers from where we can enjoy great views of Cho Danda and Larke Peak. Finally, we walk across moraines of the glacier, making a gradual ascent which becomes steeper only in the last section of the pass. From the pass, there are outstanding views of Himlung Himal, Cheo Himal, Kangguru and the huge Annapurna II. It is a longer day than usual to Bimtang, but to walk into these low pastures with the evening mist coming in with Mt. 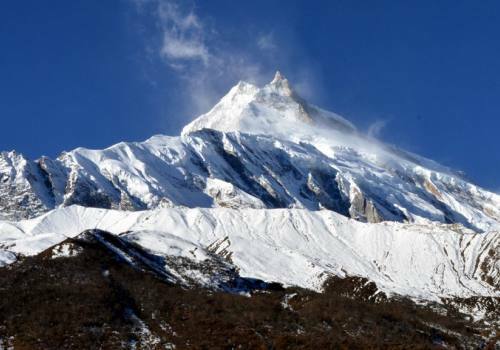 Manaslu looming close by is an overwhelming experience. Overnight in Bimthang. Day 17:Trek to Gowa (2515m), 6-7 hours walk. From a ridge at Bimthang, we can enjoy great views of Mt. Manaslu, Lamjung Himal, Himlung Himal and Cheo Himal. We descend further and cross a high pasture (Sangure Kharka) followed by a bridge over Dudh Khola. We walk through rhododendron forest and follow a trail through a narrow valley until we reach the highest cultivated land of the valley at Karche, 2785 meters. We pass across fields before making a steep climb over a ridge. The trail comes off the ridge in a big, sweeping arc to the river bank at 2580m. A short distance beyond is the village of Gho. Due to yesterday's tiredness we might take an overnight rest at Gho (2500m) having some nice lodges. Day 18:Trek to Chyamje (1430m), 6-7 hours walk. Cross a suspension bridge at the end of Gowa and follow easy trail to Tilche then climb over a small ridge and enjoy the stone paved trail as it passes through a beautiful village and walk down to Dharapani now we walk on unsealed road and cross another suspension bridge over Dudh Khola We then cross the bridge over Dudh Khola and climb up through a chorten-shaped arch, pass a mani wall and reach the Thonje village. At the village, we go through a police checkpoint and continue to Dharapani. We have entered the Annapurna circuit section from Dharapani. Further down, we come across Karte village and after quite a bit of walking we cross a bridge over Marshyangdi Khola. 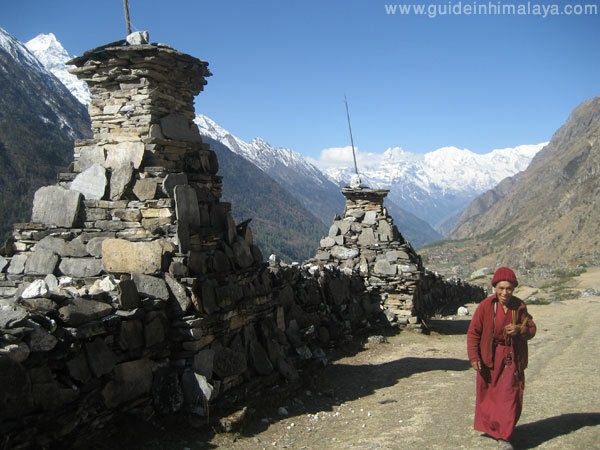 We also come across some mani walls before reaching the village of Tal then trek to Chyamje. Today is last day of our trip. We ride a 4WD sharing local jeep to Besisahar then take a connecting local micro hiace van to Kathmandu which could be a very long ride. If you can allow a extra day we can stay at Besi Sahar and take a deluxe local bus next day. Overnight in Kathmandu. Your guide will take you to your hotel.Trip ends with Wilderness Excursion. 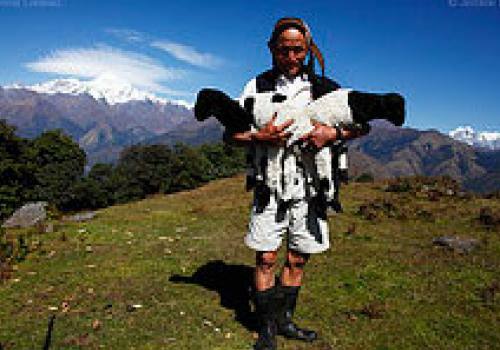 An experienced registered, English speaking and local trekking guide. Assistant guide is the number of participants are more than 6 people. Meals: 18 Breakfasts, 18 Lunches, and 18 Dinners during the trek. Hot water during the trek (1 liter per person/day). Mountain lodge accommodation on twin sharing basis. Kathmandu – Soti Khola by private 4WD jeep transportation. All shuttles from your hotel in Kathmandu. All taxes and documentations charges. All bar bills and beverages such as coke, fanta, mineral water. Gratitude and tips for your guide, porters.